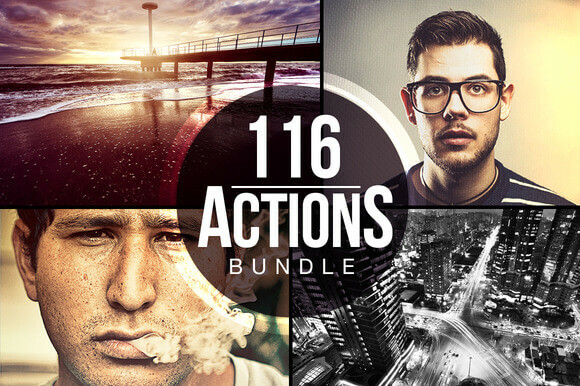 * See for yourself why the 116 Actions Bundle has been one of the top selling item on Creative Market for weeks! * The bundle consists of 5 unique themed action sets for you to apply to your photos. Not only are they tried and tested, but work with all ranges of photography from commercial portraits to family holidays. Show off your photos, and give them that something extra. * These are perfect for graphic designers, photographers, hobbyists, anyone working with images can improve their workflow with these beautiful little shortcuts. They will quickly become your go-to friend when inside Photoshop. There’s 116 to mix and match and I’m sure you’ll never get bored of playing with their wonders. With a combined price of $38 individually, buying at $28 means you’ll save yourself a neat $10 purchasing this bundle. * Wait, 20 actions costs me over $50 on other websites, you’re selling 116 for $28, whats the difference? None, the standard and quality is the same ( if not better ). Sharing professional actions with everyone at an affordable price means there’s a larger market for me to aim at. Overall its a win-win for you and me. Note : I’ve also included a set by step guide to installing the actions for those who aren’t sure how.